Only the Best for You shows you how to be a changemaker in our complicated world, while bringing out the best of yourself. Be a changemaker. Your host Carol Davies will help you unlock the secret to limitless confidence inside you and create the career, relationships, dreams, and impact on the world you want. 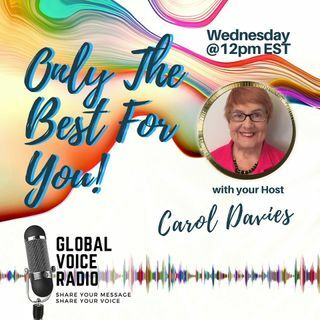 Carol and her guests will show you easy techniques to find your true purpose and passion in life, as well as how to manage your life joyously and successfully. Ep 062 How Can You Live Your Life in Integrity? Ep 061 How Can You Become a High Achiever? Ep 057 Get a New Sense of Purpose – Up Your Self-Confidence!! Ep 055 How Do You Use Intention to Change Your Life? Ep 054 Is Optimism the Essential Quality for A Changemaker?